My good friend’s brother would make his annual sojourn to pick wild blueberries that he had found once in New Hampshire while a young boy at camp. Over the many years of going back there, he perfected knowing exactly when the blues would be ripe, a factor affected by the heat and rain which he also mixed into the equation. He would return home with baskets and buckets full of the most beautiful blue and yummy berries. I think one of the factors that allowed him move away to Oregon from the northeast is that one year he went up and tractors clearing the land for houses had decimated the low bushes. There was nothing to stick around for. 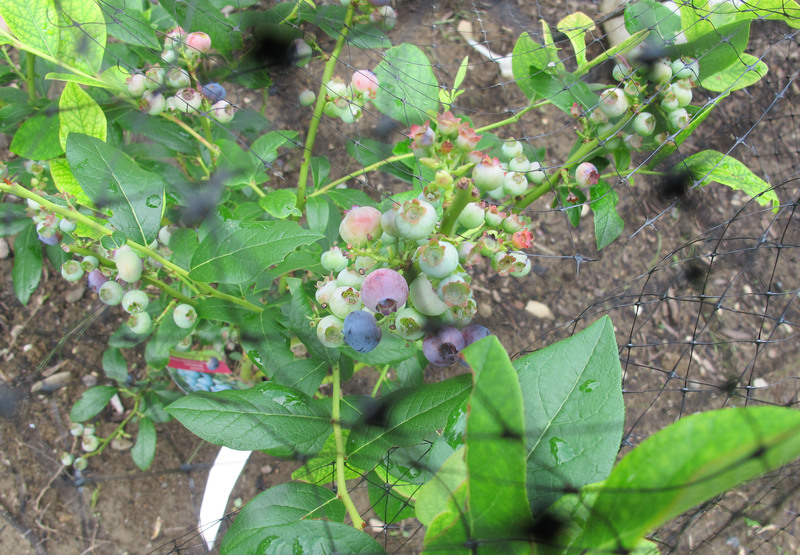 If you love blueberries, they’re supposed to be easy to grow. 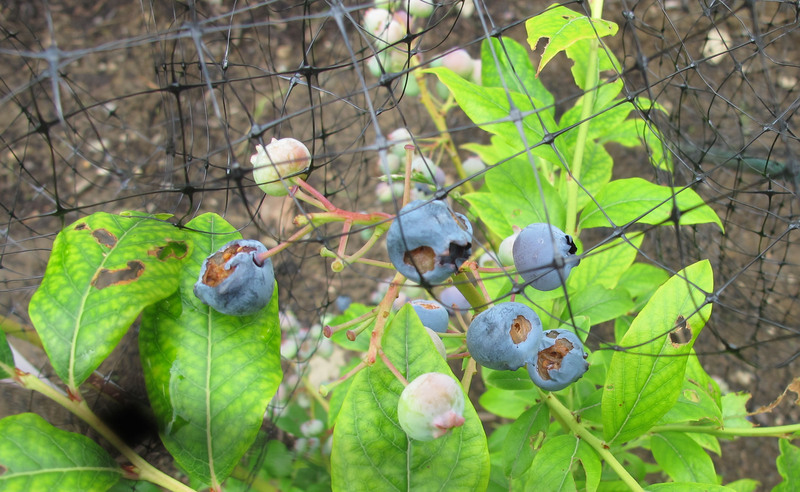 When we fixed up our beds (that get lovely direct light, something berries need) during the porch project, people implored us to get berry bushes. Didn’t take much imploring. 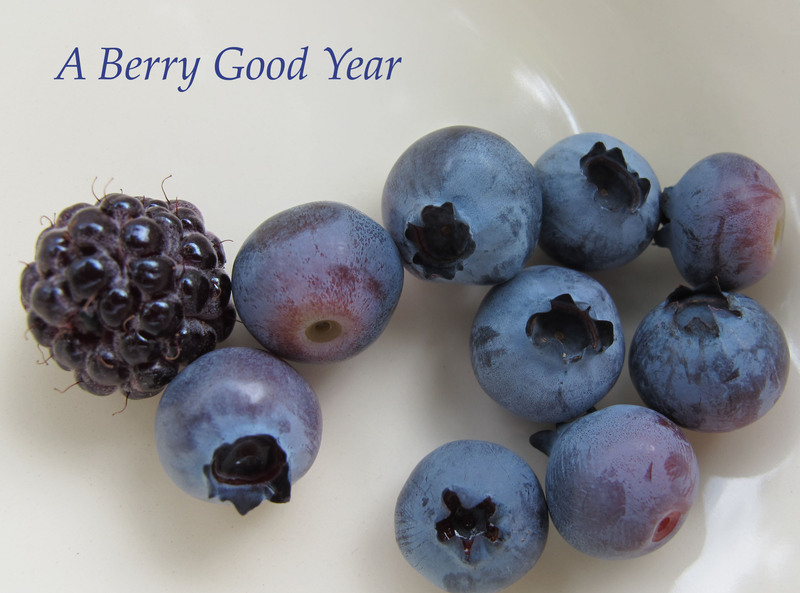 Like maple syrup, berries are B&B owners’ delight. Growing them is another thing. I’m not the most patient person, and I need to remember that berry bushes take about three years to yield a full crop. Wisdom has it that one should leave them on the bush a full week after they turn blue. Ours are doing well by my granddaughters, and as you can see, the birds are having their own spree with them. (Next year, tighter mesh on the nets!!!) We also have some blackberries, and plan a few more bushes and varieties over the next few years. Blueberry pancakes, muffins, scones, cobbler or just a handful get gobbled down pretty quickly. The little ones like them frozen to mouth pop for a healthy snack.